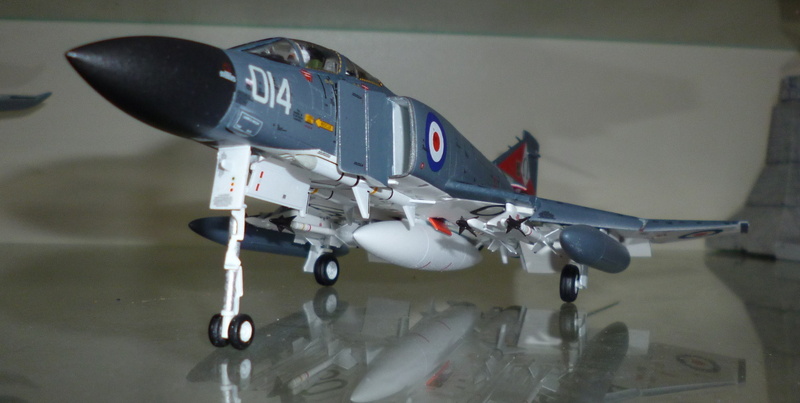 Airfix Phantom FG.1 of NAS892, modestly zapped by VF-84. Having a rather well documented soft spot for both Airfix and the Phantom, it should come as no surprise that this was a most eagerly anticipated kit. Perhaps too eagerly, as the real thing was a bit of a disappointment when I finally got my paws on it. 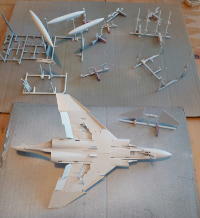 A nicely sizeable collection of bits, with some never seen before technical improvements to previous Phantom kits. 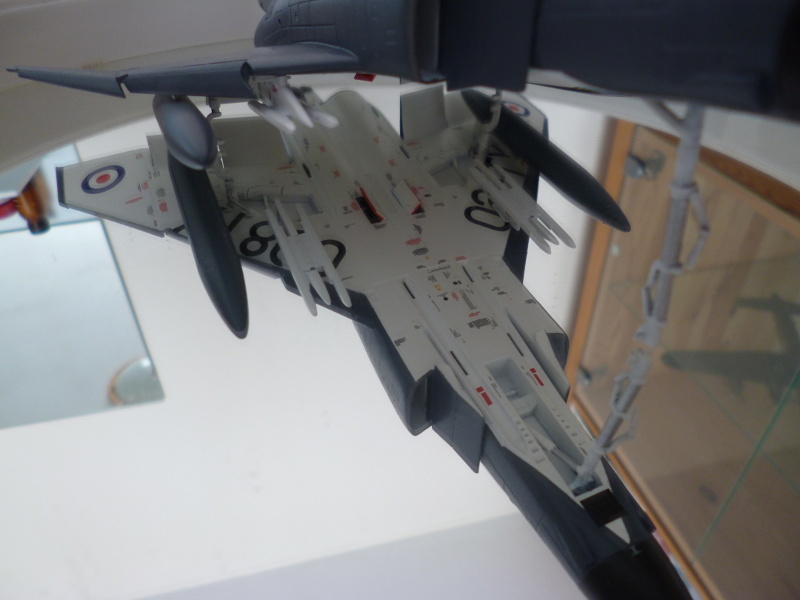 I don't know of any other Phantom in this scale that has the option of positioning pretty much any control surface according to whim, or that includes wing folds OOB, ditto for the IFR probe and radar, and the intakes are equalled only by the Academy kit. Surface detail looks great. And yet, the undercarriage looks clunky, there are neither figures nor outer or centerline pylons, and the 70s just called to inquire about the return of their inner pylons and anything other than the Sidewinders attached to them. Given the later than planned release of the kit, it almost seems like someone finally got fed up with the delays, and decided to shoot the engineers working on it and release the thing already. Personally, I'd have preferred to wait a few more months to get this sorted. Maybe they intend to follow Fujimi's example, and gradually improve the kit over time. I intend to build this one OOB, so I won't be replacing any parts. That immediately implies a dedicated air-to-air load of fuel, Sparrow and Sidewinder, as the MERs are going straight into the bin leaving nothing to put the rocket pods on. None of the kit's decal schemes add anything to the ones I already have in the stash, so I turned to a Model Alliance set of NAS 892 Phantoms in non-standard markings, carrying either little extra (somewhat) official badges, or, ehrm.., polite style improvements by USN squadrons, ranging from the rather wild "Colonial Navy" zap by VF-171 (already on the to-do list), to far more modest zaps by VF-11 and VF-84. Since there's no Phantom that can't be improved by a set of skull-and-crossbones markings, that's what this will become. I got some preliminary work done. The usual stuff really, rattlecan white in the air intakes, bits of cockpit assembled, tanks assembled. Small things, I'm too tired to deal with anything complex or finnicky right now. Finnicky things like removing the seatbelts to accommodate the pilots which will hopefully arrive from Hannants before not having them yet becomes a problem. So wierd; Airfix went through all that trouble to allow in flight and launch configurations, but left out the crew that are an essential part of those configurations.. There's plenty of good stuff about the kit to show off though, so I intend to put it in launch position; just about every door open, every control surface extended, front leg cranked all the way out. Only proper way to do this one, really. 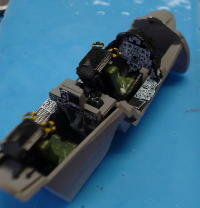 I've hit the external tanks with filler, along with the ejector markings on the Skyflashes. Construction of the Sidewinders is just wierd. Not only are they done in old fashioned slot-and-tab style, when attached to the tabs, they stand clear of the launch rails by about 0.5 mm, or 3.5 cm scaled back to real life. I'll probably end up filling the slots in the missile bodies with the tabs cut off from the rails, filling the inevitable gaps, and in the end attaching the missiles as though the whole tab-and-slot business was never there to begin with. Benchtime continues to be scare, but I got a minimal bit of airbrushing and painting done in the cockpit area. More minor fiddling with the cockpit and assorted bits today. 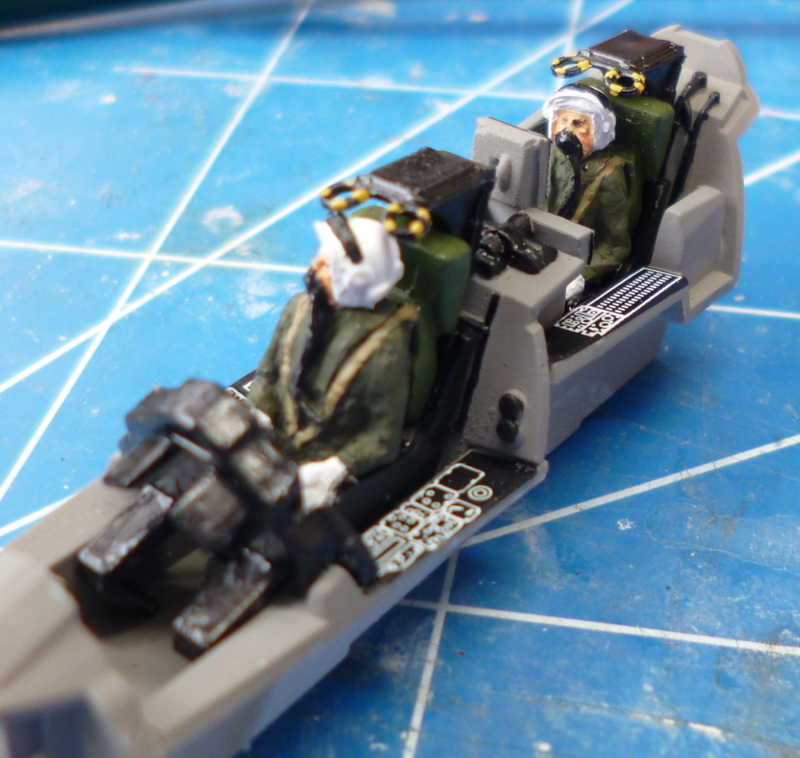 I got the (oversized) decals into the tub, and assembled the exterior parts of the ejection seats. Interesting construction, but fit between the upper and lower half of the frame is bad. Soaked the join in cement to get the plastic deeply fused. Once set, I'll slap on filler and later again sand the back smooth, hopefully hiding the fact that this started out as two parts. I roughly removed the straps from the actual seats. A pity really, they were nicely done, but would get in the way of the figures. I assembled the air intakes. Again, fit isn't perfect, at least on the inside, but easily fixed by brushing some acrylic paste into the seam. I was going to start work on the Sidewinders, but that didn't go as intended. The design of the missiles is lovely, but badly betrayed by the implementation; in addition to the huge slot cut out of the body for the connecting block on the rails, mould alignment was imperfect, resulting in a visible line along the entire length, with lots of detail in the way to damage. Also, note to Mr. Airfix: This is not what a Sidewinder on the rail looks like. Too many grumblings in the Sidewinder department, I'm not going there. The kit sidewinders were chucked in the bin in disgrace, and I dug out replacements from the Airfix High Tech weapons set. This of course means bare bodies with etched control surfaces, so there's 32 smallish bits of etch in my future, and I'm not that great with etch. I might yet live to regret this. Started work on the centre wing section. Obviously, I painted the wrong side of the auxiliary doors red.. Finally something worth taking a picture of: the office. The forward panel is still loose. This is as far as the cockpit can go until the crew arrives. The posty (literally) dumped the crew in front of my home earlier today. Excellent timing, disgraceful service. And very nice figures too. Thank you PJ Production. Now, the big question: how much of their legs will they be able to keep? And the answer is: nothing.. Without chopping up the seats, the figures won't even fit between the seat and the ejection handles. 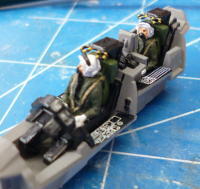 Things look a lot better when I remove the inside of the ejection seats, and put the pilots in the empty metal bucket. At the very least, I'll have to remove the seat of the seats (if you get what I mean), maybe replacing it with a thin layer of padding. That way, the pilots should fit vertically, and with any luck, I'll only have to amputate at the knees. Perhaps this is why no figures were included; they wouldn't have fit if done conventionally. Supplying both empty seat cushions and pilot figures without lower legs but with slightly padded behinds, and making the backrests of the seats separate might have worked, but might have been a tad too weird. Leaving off the seat cushions worked well, so I "only" chopped off their legs at the knees, and put their now preserved butts directly onto the seat metal. Not perfect, but at least things now look properly inhabited, and I doubt anyone will be able to see these guys are legless. I've closed up the fuselage. The joins on the fuselage aren't all that precise, so one or more filler and sandpaper passes are next. I didn't bother with the air intake corrections; there's no way I can improvise those to an acceptable level, so I'm not going to risk making things worse. 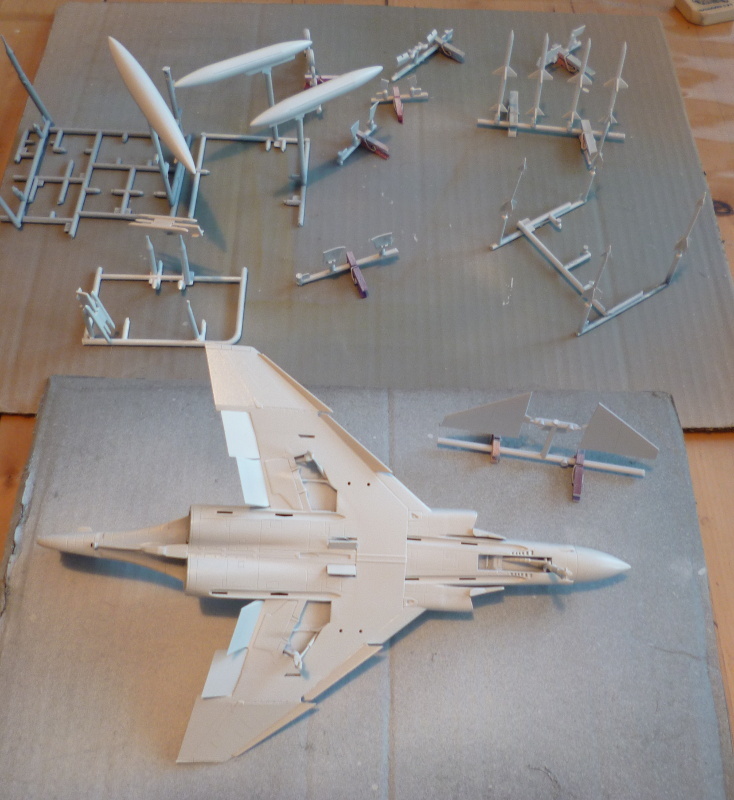 If I had plans to build significantly more Airfix Phantoms, I might have spent time designing/3d printing/casting insert parts, but I have no such plans. The fuselage is mostly done. Fit around the intakes was horrible, and the entire area seems just crude. I may fit the canopy next, to protect the interior from the mess of sanding all of that smooth. 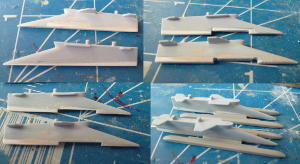 I've also made a start on the sidewinders; 8 fins are on the bodies and the CA is curing. It's starting to be recognisable as a Phantom. The tail, which seemed oddly constructed to me, went on without a glitch; clearly, the odd design functioned as expected. Airfix went overboard with the locating pins on the outer wing panels, with the socket for the primary pin serving as the pin for a secondary socket. Didn't work at all; instead of a tight fit, I would have had to force it badly. Extra silly since the locating help is quite unnecessary here. Not problem cutting the whole mess of then.. Now, the panels fit, although there's a trench nearly 1mm wide at the bottom where the panels are supposed to line up. Oh well, plenty of filler in this household..
After much fiddling, I've now got a rather neat little forest of brass-winged Sidewinders. So far, so good. The big challenge now is to get these things painted, decaled, and mounted on their rails without any of the wings snapping off in the process. This could get interesting. The Sidewinders look really cool. Until you dry fit them to the launch rails that is. Then you find that the rear control surfaces have a spatial conflict with the pylons. Always did think those looked rather narrow, so out came the calipers, to check the width over the rails. 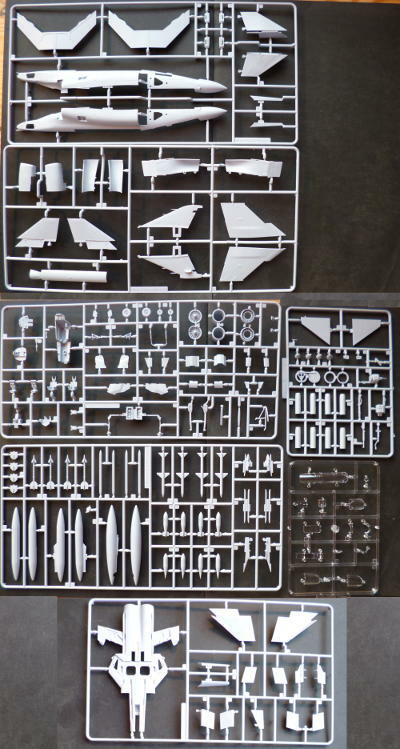 Airfix: 5.65mm; Fujimi: 7.00mm; Hasegawa: 8.90mm. YGBSM.. I rather suspect Hasegawa worked from late pylons (ie, after a certain Air Force colonel ordered his ground crew to fit utterly unauthorised extenders to the launch rails, so his unit could carry both Sidewinders and bombs on the same pylon - the idea spread..), Fujimi from early pylons, and that Airfix screwed the pooch yet again with this kit. It does explain why the tab-and-slot mounted Sidewinders from the kit stood so far clear of the rails; it just doesn't fit otherwise. Whatever the reasons behind all this, I'll have to come up with something. Something, in this case, means either raiding the spares bin for replacements, or (tempting..) see if fitting small stubs to the rails at the right locations to simulate the connecting lugs with which the missiles ride the rails gets me anywhere. The pylons are a write off. I suppose I could chop off the Sidewinder rails and replace them with Fujimi or Hasegawa pairs, but I'm now convinced that despite the size difference between those, both are supposed to be the later versions, with extenders. 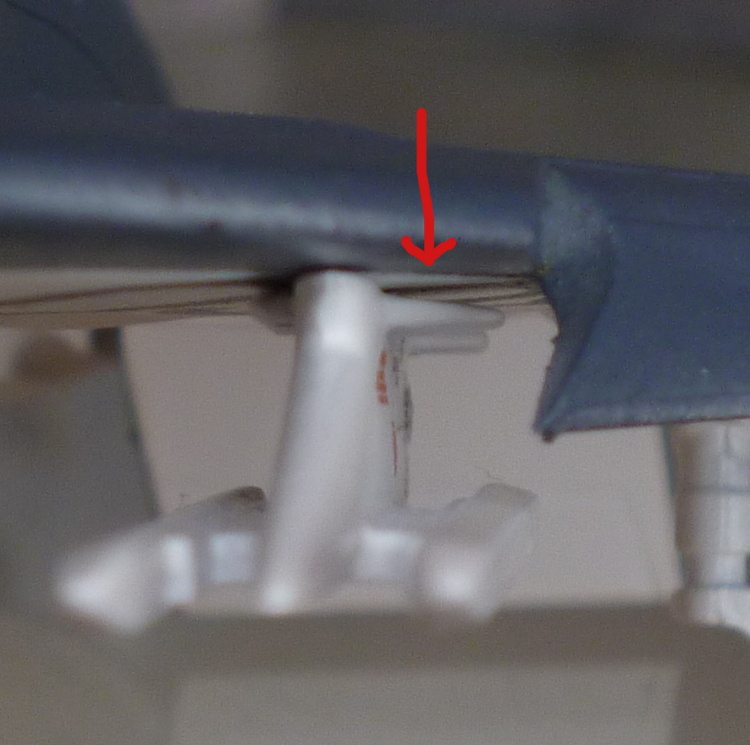 The Fujimi Spey Phantoms come with a third variant, which sits closer to the pylon (not much, but clearly visible and different), and at a slight downward angle (creating extra clearance for the missile fins). 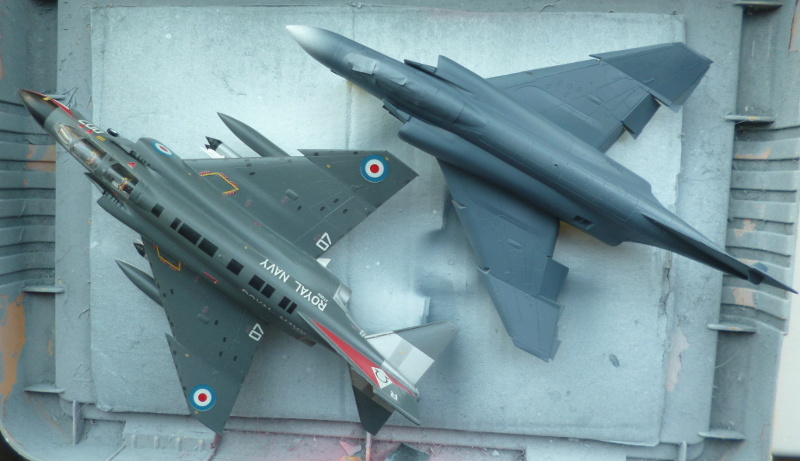 From photo's of the real things, I'd say this is the type you want for early USN and all British Phantoms. I might be able to get away with late rails with most audiences, but I would know, and it would bug me for the rest of my life (or at least until I get sufficiently senile). I could attempt to modify a set of late rails (plenty of those lying around) and stick them onto the Airfix pylons, but doing so would run afoul of yet more problems with the kit parts. The rear end of the pylons is too low by about 1mm, which means the will be angled down towards the front (assuming I line up the rails parallel to the bottom of the pylon, as they should be) and their fins will bump into the rather fat sway brace at the rear of the pylon. Yet another no go.. The only option seems to be to completely replace them with a spare Fujimi set. More expensive, useless parts from Airfix. I'm really beginning to loathe this kit. I've decided not to throw good plastic after bad. The Fujimi pylons will be reserved for a more worthy cause. For this build, I'll just learn to live with the fact that the Hasegawa rails are wrong. At least they're less wrong.. Conversion of the pylons has started. The gaps in the Hasegawa parts, designed for the corresponding pylons to slot into, have been filled up with scrap plastic, to give extra cementing surface when I get around to joining rails and pylons. The same scraps supplied the strips along the bottom of the Airfix pylons. Those strips will be filed down to zero thickness at the front, while keeping their full thickness at the rear, thus correcting the angle of the bottom edge to the wing. 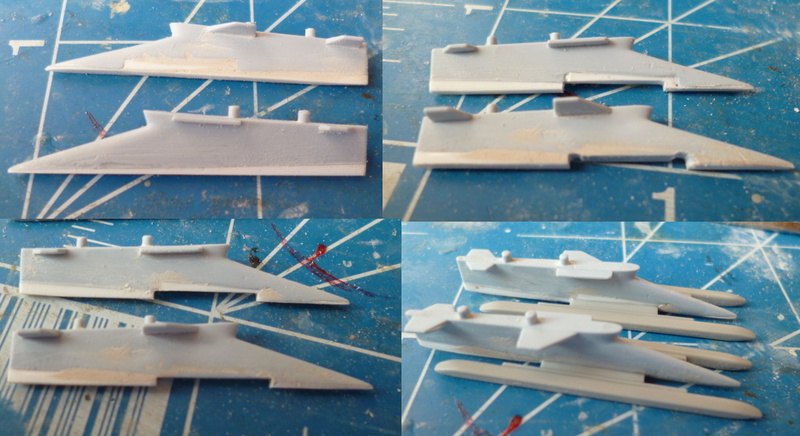 I cut the slot-filling part of the Airfix rail out of one pylon, then filled the resulting gap with more scrap, to give a clearly visible indication of the original location. More trouble.. I removed the masking tape from the canopy, and found that some of the debris from all the sanding had managed to get inside the cockpit, almost certainly borne there by water. It's gathered in the narrow space between the front of the windscreen and interior, where I can't get to it without removing the canopy, which itself can't possibly end well. I've managed to rip the roof off (any other description would imply unrealistic degrees of subtlety for the process used). After cleaning off the old glue, the damage doesn't seem all that bad. Maybe I'll be back to where I started on this particular step sometime the day after tomorrow.. I managed to get to the point where it was worth while to blast some primer over the whole thing, in order to spot hidden problems. There's a few, of course, but for once, nothing unexpected. Not long now until I can start painting and finishing in earnest. Well, that was a pleasant surprise. I had some doubts about the undercarriage (not because the Airfix one looked any worse than any other, but because I distrust undercarriages in general, and my shaky relationship with the kit so far), but this one just fell into place with next to no room for misalignments and similar entertainment. The main legs aren't even cemented to the wings; once the actuator and main leg are in their slots in the wells, and the point where they connect cemented, the resulting triangle locks everting firmly into place. The huge front leg has only slightly more room to move out of whack. Clearly, this was one of the sections of the kit where the design was completed in time.. It's unmistakably an F-4K now. The joins between the various flappy thingies aren't as clean as I'd have liked, but I should be able to clean them up well enough, and then the process of putting on colours can start. The inboard pylons have reinforcement plates sticking out to the sides, flush with the wing. Airfix added these to the parts. However, they are not flush with the top of the pylons themselves, and actually taper away from the wings, turning into some weird sort of 'wings' attached to the pylons, and looking totally horrible. I should probably have caught this sooner, but now I'm stuck with this mess. The quick and dirty solution, just glueing them to the wings and filling the gaps, is blocked by the presence of those huge RN numerals running under the pylons. Applying filler over decals in hard to reach places is just looking for trouble.. Some work with the collection of rattlecans produced a mostly white Phantom and ditto pile of bits and pieces. I say mostly white, because like many less than stellar white paints, there's a distinct yellow cast to it, reinforced in the picture by the yellowish incandecent lighting. This was not unexpected; I'd have been pleased if the semi-leftover rattlecan from the local DIY has produced something cleaner, but a nice and even base cover for a final coat of better quality white paint was all I expected. I'll hit it again with higher grade white rattlecan later; that should give me a good, bright white. Improving the quality of the white colour has failed. This bugged me no end, so I hit the top sides of the stabilisers (which hadn't been touched with off white) with the presumably better colour as well, with the same results. Somewhat annoyed, I parked the off-white next to several other models in the collection which did look properly white, and found that they too were a very nice cream colour. No difference with the current Phantom, looking good on the shelf, standing out like a sore thumb when held next to something really bright white, like a sheet of fresh paper. If the other look good on the shelf, I'm not going to fight this any further, but tough questions will be asked on this subject for future projects.. 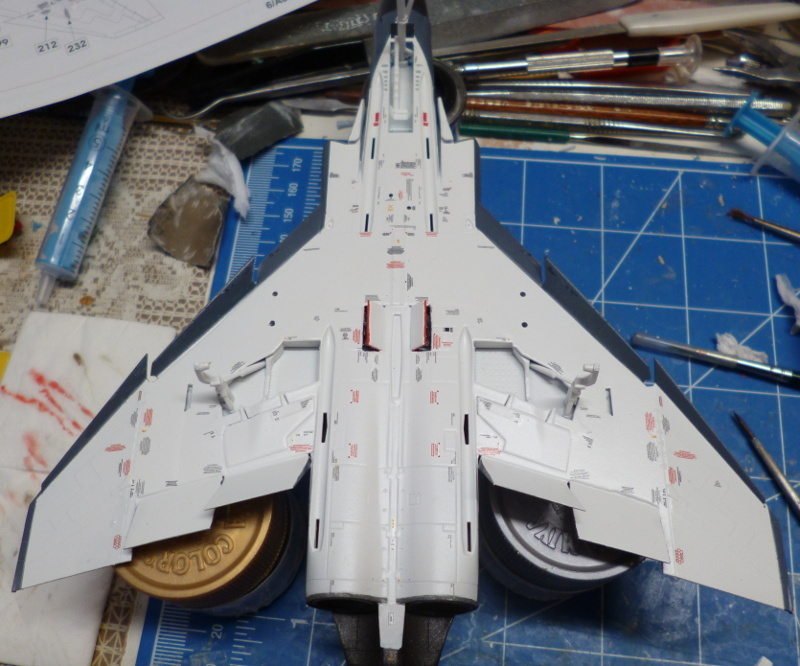 I painted up the front ends of the missiles, and tried to put the kit decals on the Sidewinders. Not a chance. The decals won't bend into that tight a curve, and besides, they are far too big, about 50% too long for the tube of a Sidewinder. Interestingly, the bands are exactly the same length as those that should go around the Sparrows, far fatter missiles. Would this be, oh, I don't know, bloody stupid? Anyway, the decals do work for the Sparrows, so I got the rear set on, and one of the rings on the Sidewinders went on the old fashioned way. I got the Sidewinders finished. At the risk of severely tempting fate: without a single fin coming off so far. The Sparrows are also ringed, and awaiting solvent to really settle down the decals. The Phantom is turning grey..
My little expedition to the paintshop is yet more evidence that colours are funny, unpredictable things. I have some Gunze Aqueous 56 Intermediate Blue sitting on the bench from an earlier experiment. 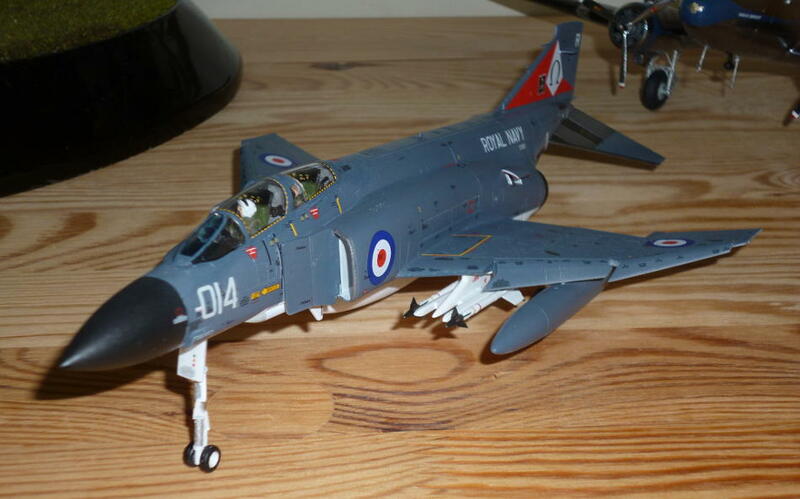 On a small test scrap, it looked like the right colour, although slightly lighter than the older Phantom on the shelves, which was painted with Humbrol 123. So, happy to have found some use for it, I blasted it all over my current victim. Like always, the paint behaved perfectly, but the colour sprang a surprise on me. It looks rather different on a large surface, and now it looks much darker than the other plane, and quite a bit more blue. Entertainingly/frustratingly (take your pick), this is one of those colours that appears drastically different depending on the current lighting conditions, so the camera makes one sort of total hash of it without flash, and a completely different hash with the flash. Take the colour in any picture from here onwards with a big pinch of salt. So, it's probably the wrong colour, but it does look good. Unless an inspection in daylight (the one good thing about the current weather is that we have an abundance of that) turns ugly, I'm sticking with it. Seen like this, I can suddenly see why the colour is called "blue" instead of "grey"; in this light there's actually enough blue there to qualify, although to my eyes, it's still mostly grey. It's also painfully obvious that this is a very different colour. On the flip side, it's not further off the target than what passes for white at the bottom, and I do think this will look good, so I'm going to stick with it. If I get called out on it too enthousiastically, I'll claim it was those dastardly characters from VF-84 who only put that little flag on the tail to distract everyone from the fact that they had actually zapped the whole plane..
Airbrushing is (at least in theory) finished, and all but the canopy masks are off. A few minor issues showed up, but well within expectations. When contrasted with the grey, the white suddenly seems beautifully bright, so that turned out well. The Sparrow missiles are ready to join the party, so the Phantom now has a complete set of teeth. I normally don't mask canopies in any detail; the masking tape just covers all the transparent bits, along with the frames and a margin on the fuselage. I hand paint the frames after the airbrushing is done, and for this I've developed a (perhaps) somewhat odd technique. I paint on the frame as well as I can, in the full knowledge that I'll occasionally slip onto the clear parts. After a section of frame is painted imperfectly, I go back to it with a very fine brush lightly dipped in white spirits, and pull that along the edge of the frame. This picks up any stray paint, and the result is better frames than I ever managed with masking and airbrushing. I just ran a test on a canopy piece dipped in Clear. It looks like the paint on, paint off technique with Gunze and IPA is within the limits of what it can take. Now, I'm sharp enough for a bit of testing now, but for the real thing I need to be really on top of my game, and I don't think that will happen until I get a really good night's sleep to shake off the last effects of the (now fortunately passed) heatwave. Sometime this weekend though.. It works, but it's slow going. Although Gunze is better than Tamiya in this respect, it too suffers from a second coat over a half dry previous one tearing up the on already in place, and being alcohol based acrylic, the window between the paint going on and going from wet to half dry is small. Oddly, this means acrylics are slower to work with than enamels; with enamels, I can continue working while the first pass over an area is still wet or already half dry, while with acrylics, I have to wait until they're more completely cured. What the punitive afterlife? The engravings on the canopy are are nice and crisp, so painting is relatively easy going, but the section between the two cockpits is no more than a pair of rims from left to right. Someone forgot to engrave the edges between the almost triangular windows and the solid frame in the centre. This is beautifully done on the open canopy parts, so it's not like the don't know better, but on the single piece closed canopy there's not even a hint. I'm going to have to make do with paint only, thrown on with no more that the Mk1 eyeball to keep things symmetrical.. By the way, bumping paint of the transparencies with a toothpick works like a charm too (I missed a bit with the IPA at some point), much better than any attempts I ever made against enamels. I think I've got the canopy mostly sorted. Some minor touch up probably still turn out to be necessary, and some of the damage from when I had to rip it off is still visible, but by and large I'm happy with it. I've started putting on the decals on the underside. About two dozen are on, I've barely made a start, and I can't handle the model any more for fear of shifting the decals already in place. I'll consider that a hint to take a break and let them set. This is going to take a while .. The final four decals (for the lower surfaces) just went on, in part covering the stencilling (hence the need to clean off any residue before putting them on). Tomorrow will see them hit with solvent, followed by more cleaning. Then, once I'm certain all of the water has gone, varnish to protect the decals at least a little, and then once that is cured, I deal with the pylons. This will drag out the build, but I'm not going to cut corners and risk more trouble. I've also discovered some trouble of my own making. 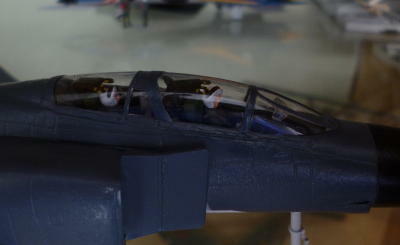 The finishing of the join between the canopy and the fuselage is rather less than stellar. I'll have to spend some time fixing this and then touching up the paintwork. I have significant control problems when using sandpaper in tight spaces, or where high precision is needed. For many jobs, the curved diamond files I bought a while back are good enough, but they do leave fine, but visible scratches. That won't do for the corrections around the canopy, so I finally got around to improvising a bit of tooling. 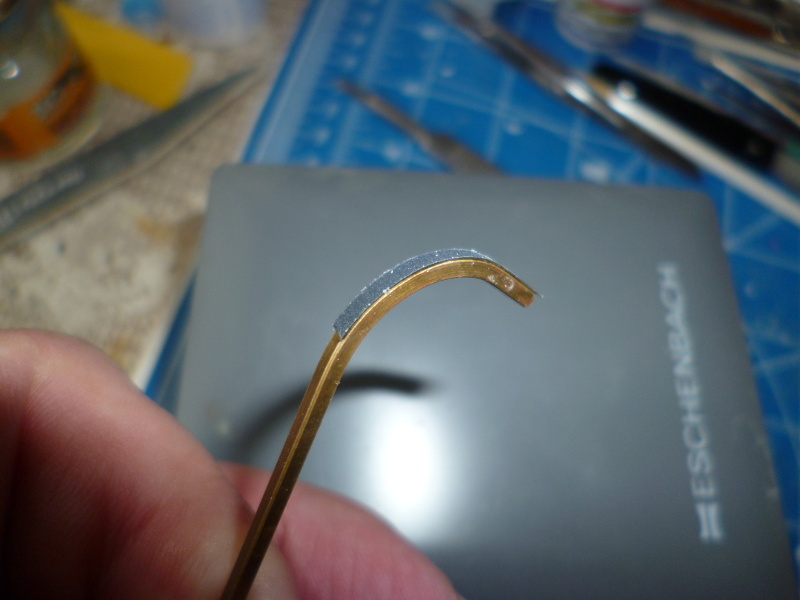 Just a bit of 1.2mm square brass tube, bent around a convenient piece of pipe, with some 800 grit sandpaper glued to it. I'm kind of eager to try it out, but I'd better be patient and let the glue set properly. Stuffing while milliput into the gaps between the reinforcement plates and the wing seems to have worked.. I think I got all the milliput washed off, but the truth will only be known once things have dried out completely. Some residual haze might be visible, but I'm hoping I'll be able to wipe off any that shows up with relative ease, without wrecking the varnish and decals underneath. Once these two are completely solid, I'll put on the wing tanks, which may need similar treatment. The wing tanks are on. The gap between them and the wings are noticable, but far smaller than those of the wing pylons. I won't be using milliput on these, rather acrylic paste (either from a big jar, or from a far more expensive tube labelled "Vallejo putty" or "Perfect plastic putty" or what have you), brushed in and off again where it isn't wanted. The brass sanding tool works, but I think a coarser type of sandpaper would be even better. The 800 clogs up with sanded off paint entirely too fast. Still, the canopy area has been cleaned up well enough. Fit between the wing tanks and the wings was better than I'd thought. Not perfect, but I don't think any attempts to get rid of the remaining gaps will improve the quality of the model. I'm calling the lower parts done for now. The top surfaces have been stencilled, and I'm just about ready for the asylum. Only about a hundred more to go on the sides. 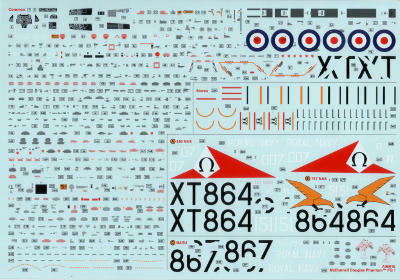 And maybe a dozen of more respectably sized decals, of course. I've finally gotten the last of those infernal stencils on. Decals should now be completed in the next couple of days. I was beginning to despair of ever being able to report this, but the decals are on. Well, most of them, the stripes along the cockpit frames will have to wait until after I clean and varnish the whole shebang, but that can't be helped. I like to think I found a good spot for the "R"s. It's wrong, but at least it looks right. 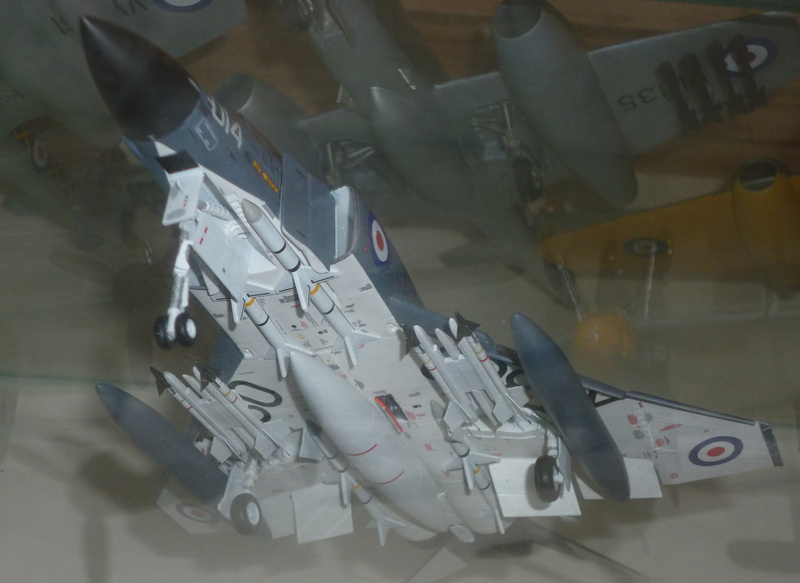 Navigation trail: Home » Phantoms » Airfix Phantom FG.1 of NAS892, modestly zapped by VF-84.